Feeding figures like Nelson Mandela, Mikhail Gorbachev, Hillary Clinton and Aung San Suu Kyi is no mean feat, yet Kieran Maxwell – better known as Max, exiting Head Chef at Trinity, is having none of it. At once humble and no-nonsense, he insists that “the name of the guest shouldn’t up the standard because the standard should always be there. That was the only approach for me”. This approach has obviously served its purpose as Maxwell bids farewell to the College after 35 years in the kitchen. Maxwell is modest and gracious about his achievements, yet there is a grit to him that surfaces at times, a necessary trait seemingly baked into the makeup of every head chef. This same grit is evident in the story he tells about how he got into cooking in the first place. A long-haired teenager, Maxwell was given an ultimatum by his science teacher: cut his hair, or do home economics with the girls rather than science, the boys’ option. Maxwell shrugged his shoulders. He would study home economics, then. It was a decision that made jaws drop, he says, and, along with a part-time job in a bakery, it sealed his pursuit of a career in the industry. Soon after, he left Ireland to work in hotels in Frankfurt and then Zurich, picking up new skills and perfecting his own from the two countries which “were so far ahead of us at the time”. 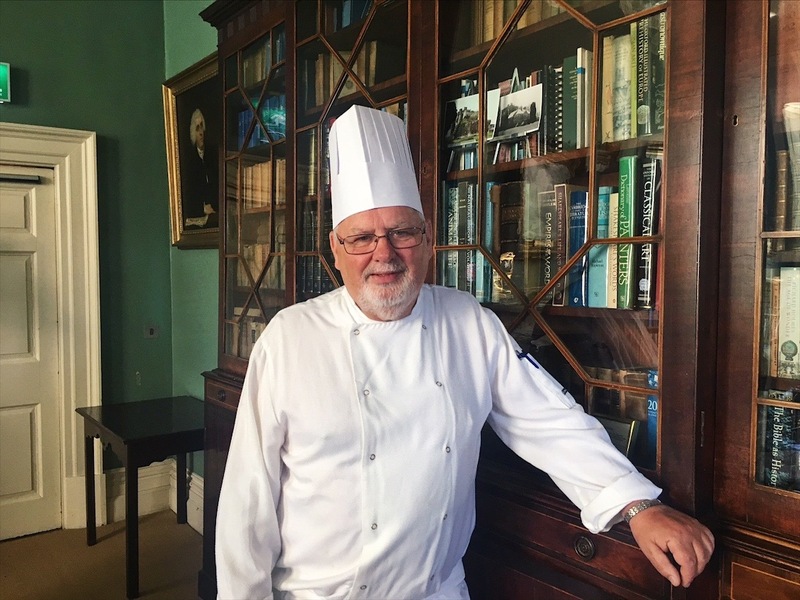 Upon returning to Dublin, Maxwell took a job in Bloom’s hotel, but after being made redundant there, he heard about the job as Second Chef in Trinity. “And the rest”, he says, smiling, “is history”. This attitude of putting your head down and getting on with the job translated into the way Maxwell led his team as Head Chef. “One thing I always tried to instil in my chefs”, he says, “was to forget about what the waiters are doing, get it out of your mind. You worry about what you’re doing in the kitchen and what you’re putting on the plate. If you do that correctly everything else will fall into place. Take care of the pennies and the pounds will look after themselves”. He comes across as a natural leader, the proof not only in the pudding but in the advice he gives to his staff. By nature intrinsically humble, Maxwell never minded much about never meeting any of the well-known people he fed: “As a chef, you’re in the background – that being the kitchen. And that’s it, you know.” There is sincerity behind the words. Maxwell, it seems, really didn’t mind operating behind the scenes. He preferred it. “I was okay with it because it was what I chose to do. That’s where I was happiest, in the kitchen. It sounds like a bloody cliché, but it’s the truth of it.” He admits, however, that cooking for Nelson Mandela was the highlight of his career. Serving Hillary Clinton a few weeks ago at the term dinner was also a great high to go out on, he says. While he has enjoyed a long career, Maxwell is looking forward to his retirement and the simple things that go with it. An avid motorcyclist he has a few projects lined up: building a 1966 Heinaku scooter out of the box, involving himself more in the Gold Wing motorbike club, of which he’s a longstanding member, and spending more time with family – his new grandson Alfie in particular. Ever deferential, it seems Maxwell is thinking aloud when he says “well, there’s a new head chef now, so I’ll soon be forgotten”. Even after a mere 30-minute encounter, however, that’s hard to believe. 35 years later, it’s safe to say Head Chef Max has left his mark.